I spent the last week finalizing the rewrites to my manuscript. The entire work was done in my tool of choice - Scrivener 2.0. 1) You keep me honest: What's your word count goal? Set it, achieve it. 3) You let me change my mind: Snapshots rule! Version control? Compare documents? 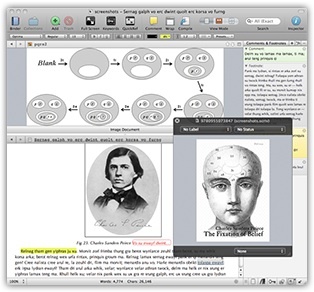 Scrivener does that on steroids! 5) You let me look at my work on my iPad: ebook output is phenomenal! The formatting is spot on. Calibre? Fo'get about it! Write it at night, ebook it to my iPad before I go to bed, review my previous day's work while drinking coffee in the morning (double espresso Illy brand coffee). 9) You let me compile the whole thing in a beautifully formatted manuscript: I find that I don't need to do much formatting (at least during this stage of my writing) or export to Word. I am self-sufficient on one tool. B) I now have a Mac because my PC died one too many times and a friend gave me his old Power PC. Wow looks like things have changed a lot since the last time I tried Scrivener. Will have to give it a second look.